Much of the best scenery in the Wakatipu basin is inaccessible in 2 Wheel Drive vehicles so don't miss out on the opportunity to see stunning backcountry, rocky chasms and mountainous roads. Off Road Adventures Queenstown will take you in their comfortable fleet of high-quality 4WD vehicles that are purpose-built to navigate canyons, gorges, river crossings and unsealed roads, enabling you to get to the hidden gems of the Queenstown region. Off Road Queenstown's 4WD tours will take you to Lord of the Rings country where you can view the jaw-dropping panoramas that made New Zealand the perfect location to bring Tolkien's stories to life. You can also choose a tour that takes you through historic gold mining towns, now preserved as living museum pieces of nature. You will take in multiple river crossings and steep mountain roads to get to cinematic viewing points. Your guide will present a journey through chapters of the famous trilogy and you will see the filmic scenery come to life at sites such as Pillars Of The Kings and the White Mountains. A picnic lunch is included. If you opt for Glenorchy instead of Wakatipu, you will take in million-dollar views as the tar-sealed road winds its way along the side of the lake, taking you deep into Rings country. You will see what made Peter Jackson settle on the Glenorchy area for some of the most dramatic backdrops in the trilogy, such as the glacial lakes, ancient forests and towering peaks. You will also see locations for The Hobbit, Wolverine and Narnia films. A picnic lunch is included. This tour combines fascinating history about Queenstown's gold rush era along with rugged, rocky scenery. You will travel deep inside Skippers Canyon which was once the beating heart of local gold mining operations. Relics and historic bridges still exist and your knowledgeable guide will tell you insightful stories about the area. Gold panning demonstrations are available on request. Accessible only by river, Macetown is a fascinating part of Queenstown's gold rush history. You will make more than fifty crossings over the Arrow River taking you deep into the rugged, rustic historic area of Macetown. You will learn about the hardships miners faced and marvel at the primitive but effective machinery they used to make a living. A shorter trip, this is perfect for those on a limited timescale. You will see the highlights of the region as known only to locals. 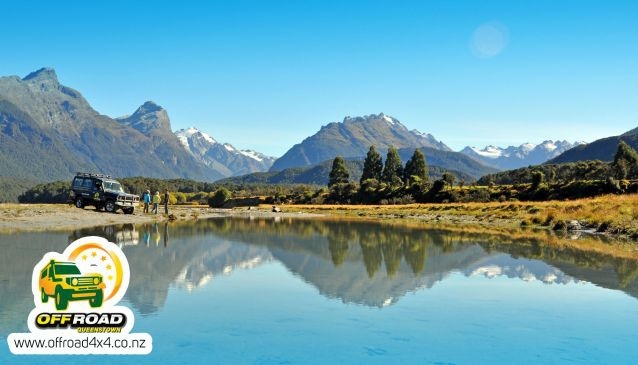 Your Queenstown guide is more informed than a guidebook and will show you mountain ranges, river crossings and canyons. You can choose your itinerary and custom make your own tour. The Landcruiser seats 7 so this option is perfect for a group or just one or two people who would like a private tour. Backcountry picnics, 4x4 training and even helicopter combos can be arranged.